When it comes to high flying stocks in the Dow, Boeing is a top performer, as it is up tenfold since the 2009 lows. The trend in BA is up and nothing of late has changed that! 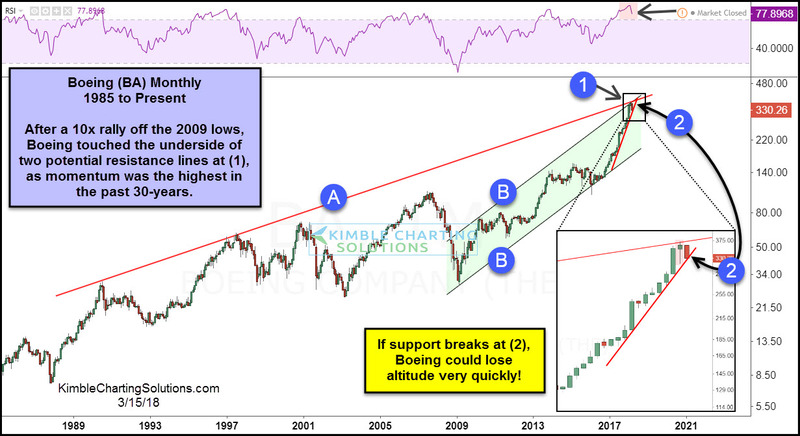 The strong rally saw Boeing kissing the underside of 30-year resistance line (A) and 9-year rising channel (B) at (1) last month. While kissing the underside of these lines at (1), BA might have created a bearish hanging man pattern. With momentum hitting the highest levels in 30-years, if rising support at (2) would break, Boeing could decline a large percent. With Boeing being the most expensive stock in the Dow, if it would decline, it would have a large impact on the Dow. Keep a close eye on what BA does at (2) as this support test is important for the stock and the Dow.